Fly from Windhoek to the Namib Desert today. Arrive at Kulala, located on the Namib Rand Nature Reserve, this afternoon. This beautiful lodge has a swimming pool, bar and dining area overlooking the stark desert landscape of the Namib. Each room at Kulala has a roof-top sleeping platform offering guests the unique opportunity to sleep under the stars. The lodge offers nature drives on the reserve as well as a guided excursion to the dunes of Sossusvlei through Kulala’s private entrance. On the morning of Day 2 you can wake early and take your inclusive guided drive into the National Park area of Sesriem and onwards towards Sossusvlei, around 70km from the Park entrance. The entrance opens at sunrise and this is the best time of day to see the dunes. The desert can be extremely hot in the middle of the day, so please remember plenty of water, a hat and good walking shoes! Enjoy the amazing scenery of the desert, and maybe take a short walk to Deadvlei, a bizarre collection of ancient camelthorn trees, or climb the nearby dunes. Return to Sesriem and perhaps take a look at Sesriem Canyon before returning to the lodge. All meals & activities included + most drinks & laundry. 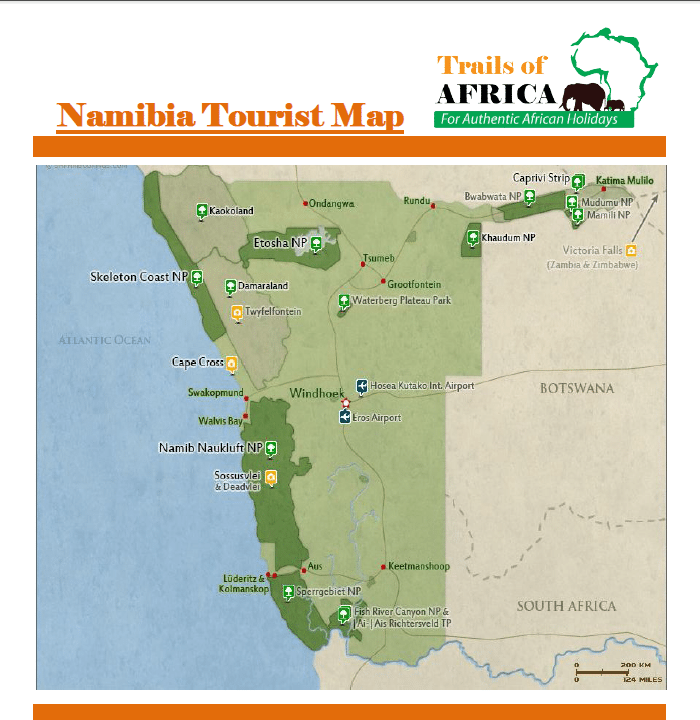 Today you will fly from the Namib Desert, up the coast and inland to Damaland Camp, probably making a fuel stop in Swakopmund. The highlights of this beautiful area include the rock art site of Twyfelfontein, the Burnt Mountain and the Petrified Forest collection of ancient, fossilised gymnosperm trees. Damaraland luxury camp is set in its own 80,000 hectare reserve, often regarded as one of the most successful eco-tourism project in Namibia. Situated on the dry Huab River, it is one of the best places to spot the rare Desert Elephant, with 80% of guests who stay two nights being lucky enough to enjoy a sighting. It is also home to the occasional lion and cheetah and a multitude of antelope and rare birds. The lodge has a bar and restaurant situated under canvas with an outside boma eating area and open fire area with stunning views along the valley and boulder strewn plains. The camp also has a natural rock swimming pool, perfect for relaxing between game drives and walks. Accommodation is provided in ten luxury en-suite tents. All meals & activities included + most drinks & laundry. You will fly onwards today, from Damaraland Camp to Ongava. Ongava Lodge is located in a private nature reserve bordering the southern section of the famous Etosha National Park. In addition to the early morning game drives that are offered from the lodge into Etosha itself, you will be able to enjoy viewing the many species present around the lodge grounds during afternoon drives. Many fascinating species can be found in Etosha and on the Ongava concession, and you may hope to see animals including lion, leopard, elephant, rhino, giraffe, zebra & antelope in addition to many bird species. The lodge waterhole situated in front of the main deck provides the perfect place to relax and watch the movements of the many animals quenching their thirst. The accommodation is in luxurious en-suite brick & thatch chalets and a bar, dining area and swimming pool blend in to the surrounding environment. All meals & activities included + most drinks & laundry. Fly from Ongava Lodge to Windhoek International Airport today, in time to connect with your onward flight (own arrangements).